Abhishek Bacchhan, Bollywood Star, Star son of Stars Amitabh Bacchhan and Jaya Bhaduri Bacchhan has his birth Anniversary on 5th of February 2010, Rikhav Khimasia, has a look at his future for the 12 months commencing 5th of February 2010. Transiting Saturn is in applying sextile to natal Saturn on his birth Anniversary. Note that Saturn is his Sun Sign Lord. Mercury Return too on this Birth Anniversary. 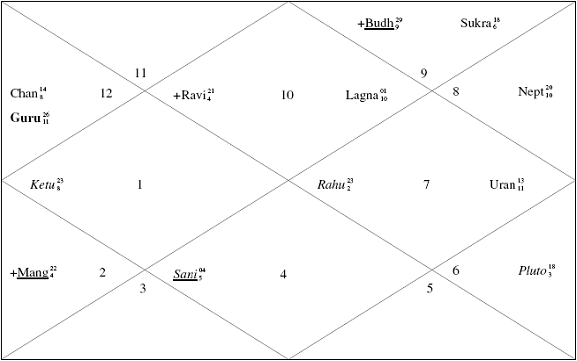 Transiting Rahu applying to his natal Mercury – Venus Mid Point, on his Birth Anniversary. The other regular transits are there of course, but the above three are of typical. The year will definitely set him for life. Strange developments, foreign matters, relocation, new changes in his career, for his career are foreseen. May I suggest a possible political alignment or development? Lets see what comes up. His creativity, acting, intelligence, career, luck, performance will be heavily influenced by technology, psychology, people of other nationalities and religion. He tends to undergo a process of inertia, reflection around and after his birthday for a long time and will be influenced as well as supported by his spouse in breaking free from his natal introvert nature and psyche. It seems highly probable, that some months later, mostly after May 2010, he may come up with direct approach and may be quite aggressive in his demeanor and communications. He will realize that acting is not his only destiny, there are things as profession in his destiny and may definitely embark on the same. Rikhav Khimasia suggests that Abhishek should in fact take a break from his already hectic life to delve into his inner feelings and ask himself questions, think, ponder and find answers to his life. This done till May 2010, sincerely, will enable him to make a base for his life again. If he misses this year, he loses a chance of his life time.